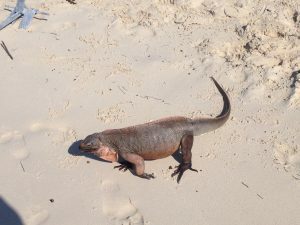 We hang out at Nassau for a week, stocking up on a few last minute items and visiting some favorite old haunts. Jackie and the staff at Bay Street Marina all remember Missy (well, and us too) and make a big fuss over her; she eats it up like Milkbones. We meet up with Jeff, a good friend of ours from Ft Lauderdale who happens to be in Nassau with his girlfriend Robin to celebrate his birthday. We enjoy an excellent Italian meal and evening in a beautiful courtyard at Café Matisse in downtown Nassau. As we part, we exact a promise from them to hook up again with us down in the Exumas. We also make a point of hitting Senor Frog’s again. It’s a blast watching the cruise ship tourists acting the fool at the emcees’ behest, figuring what happens in Nassau stays in Nassau. One guy does five shots back-to-back and then chugs down an entire Frog Buster (one of these is enough to lay us out) to win…free shots for him and his buddies. Ah, to be young again! 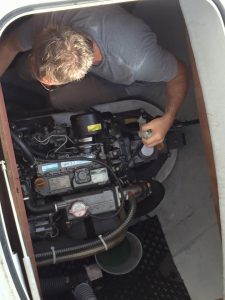 I take advantage of the time at the dock to service JOD’s twin diesel engines, changing the engine and saildrive oil. I follow the manual’s recommendation to change the oil after every 100 hours of operation. The old oil always looks good and could probably be used for another two or three hundred hours but its good practice to change it often; oil is cheap, engines are expensive. As much as there are other spots we’d still like to go to in Nassau (Potter’s Cay for conch salad, Junkanoo Beach to visit with Keith and LeeAnn at Seagull’s Tiki Bar, Junkanoo for Boxing Day and New Year’s Eve), we anxious to get to the Exumas and not end up staying in Nassau for 3 months like last year. 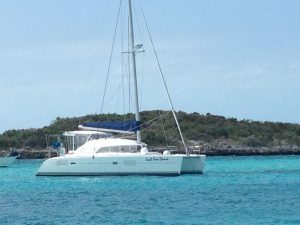 Our next hop is a relatively short 6-hour trip to Allan’s Cay at the northern tip of the Exumas chain and we have a good weather window coming the week after our arrival in Nassau. We make the decision to go; we’ll be stopping in Nassau on our way back to the US anyway so we can visit all the places we missed then. The trip from Nassau to Allan’s takes us across the Yellow Bank, another area of shallow waters of 10-15 feet deep. It always amazing to be out of sight of land yet be able to look down and see the bottom right below your keel. We can pick out individual starfish laying on the bottom. I spend a good amount of the time crossing the Yellow Bank up front on watch since the Bank is known for coral heads that rise to just below the surface of the water, just waiting to rip a hole in the bottoms of unsuspecting boats. Allan’s was our favorite spot in The Bahamas last year. 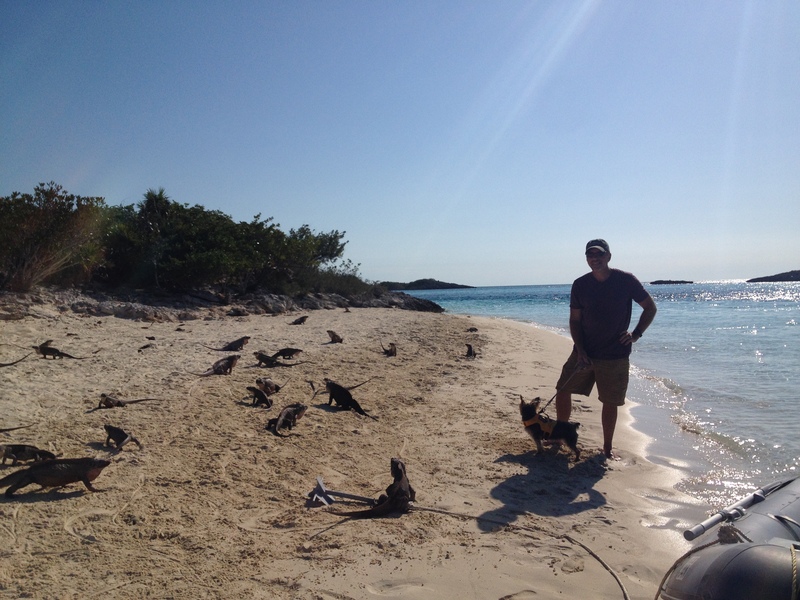 It’s a collection of 3 deserted cays and is famous for the massive iguana population on Leaf Cay. Tourist boats run up from Georgetown and down from Nassau, bringing loads of cruise ship tourists who spend 30 minutes or so feeding and running from these prehistoric looking lizards. They’re actually harmless and only want to be fed, but they have poor eyesight so hand feeding them is a risky proposition. They’re so used to being fed they swarm the beach as soon as the tour boats pull up. We just like Allan’s because of the beauty and the quiet. The water here is clear as crystal and painfully blue. The tour boats are done by early afternoon and the current that tears through the anchorage twice a day discourages a lot of cruisers from staying here. The night sky is practically ablaze with stars. There’s also conch to be found at Allan’s and I know a couple of spots here that fit the bill. Conch favor shallow grassy areas where they can feed on the aquatic life that live on the grass blades. The conch lays on the bottom with the shell opening face down; the backs look like coral growth (the shells you buy have been bleached) and can be hard to pick out. Add to that the fact that the bottom is littered with empty shells people have tossed back in the water and a conch hunter has his work cut out for him. I do manage to find us six good size conch. While my cleaning technique would still embarrass (or perhaps entertain) a local, I’m getting better and harvest a good amount of meat. I pound the meat with our new meat mallet (a great improvement over the fish bat I used last time) to tenderize it and then chop it up for a conch curry. We likes us some curry! 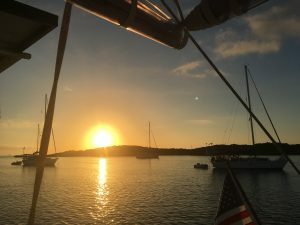 With Christmas approaching, Cindy and I decide to sail to Blackpoint on Great Guana Cay to celebrate the holidays there. This small settlement (we estimate a couple of hundred people) is a favorite with cruisers in The Exumas. Its wide bay accommodates a lot of boats, the locals are welcoming, there’s decent cell coverage and good wifi ashore and enough stores to stock up on essentials. So, after waiting out a short blow, we pull up anchor and head south once again. Our plan is to do a long jump down to Warderick Wells, home of the Exuma Cays Land and Sea Park, stay overnight and then do the short hop from Warderick to Blackpoint the next day. The weather is gorgeous; blue skies, 1-2 foot seas and best of all, favorable winds. For the first time since sailing from Ft Lauderdale to Miami, we run out JOD’s sails and cut off the engines. Moving under sail takes the experience to a whole level. The hum of JOD’s engines is a reassuring sound but under sail all you hear is the sound of the hulls slicing through the waves. Well trimmed, the jib and main sail are taut and boast an elegant curve to them. With 15-20 knots blowing in off our port beam, JOD clips along at a cool 7 knots. And it’s all free! At that rate, we reach Warderick Wells by mid-afternoon, drop our sails and motor into the south anchorage. There are only a couple of other boats anchored and even the mooring balls in the north anchorage are mostly empty. We drop our Rocna, run out a hundred feet at chain, mix up a couple of drinks and sit out in the cockpit, enjoying the peace and beauty of the Park. The next morning we pull up anchor and head to Blackpoint. The day is basically a repeat of the previous one; blue skies and sunshine with favorable winds. We run up the sails and let the winds propel us southward. There are enough islands in the Exumas chain that we are never outside the sight of land. 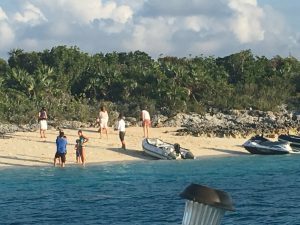 Many of the smaller cays are deserted and several are privately owned; David Copperfield and Johnny Depp both own islands here. The hop down to Blackpoint is a short one, only about 22 nautical miles. As we approach the harbor, we strain to see how many masts are visible, an indication of the number of boats in the bay. This is the popular time of year for cruisers to be in the Bahamas and we are always a little concerned that there will be no room at the inn when we arrive. However, there are only about a dozen boats there, Blackpoint’s expansive harbor could hold five times that many. We drop anchor near the Government dock (shortens our dinghy ride) and get ready to head to shore. There’s another blow coming in a couple of days, so we want to get rid of our garbage and stock up on more eggs. We also want to hook up to wifi so we can plug back into The Matrix and see what’s been going on in the world for the past couple of weeks. Though it takes a few days to get used to, disconnecting from the electronic world is one of the biggest charms of the cruising lifestyle.